Nothing improves speed like a good hot wax. If you are an “Instagram skier” then you probably don’t need this, because it’s likely that you look fast enough. Swix’s Waxing Iron is the golden ticket for skiers that prefer to go fast in real life. Easily melts any kind of ski wax, butter, or whatever glide-y substance you smuggled out of Europe. Use on your ski bases and skins (at lower temperature). One plug, one adjustment dial, and an angled base make attaining free speed simpler than ever. From spring slush to chalky crystals, the Swix Wax iron will spare you unnecessary effort all season long. 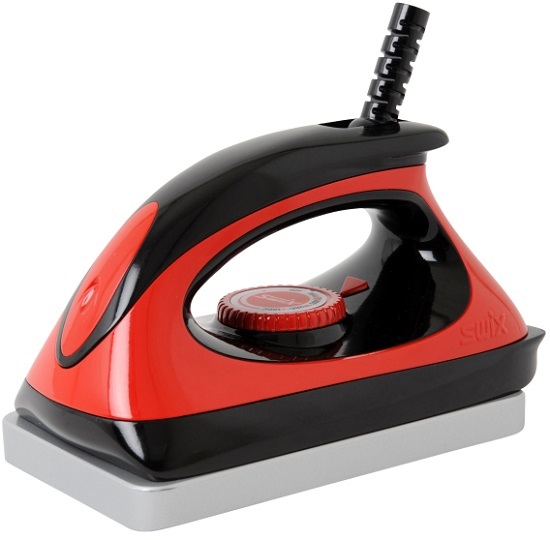 This is a highly unusual design -- in a good way -- for an "economy" waxing iron. Until this model came along relatively recently, all price-point waxing irons were distinguished from their pricier brethren by a very thin base plate. This meant the iron didn't hold heat very well, so once you started ironing your skis, the wax wouldn't melt very well, yet as soon as you took the iron off your skis, the iron would start smoking up your room. This model though has a base plate of the same thickness as models costing 3x as much. So no reason to spend any more on a waxing iron, and no reason buy any of the other cheap competing models either. how thick is the base in mm? Official spec is 14mm -- thicker than some of Swix's own more expensive models!